CRITERION VALIDITY Criterion validity reflects whether. a scale performs.as expected in relation to other variables selected as meaningful criteria (criterion variables). Criterion variables may include demographic and psycho graphic characteristics and behavioral measures, or scores obtained from other scales. Based on the time period involved, criterion validity can take two forms: concurrent and predictive validity. Construe VALIDITY Construct validity addresses the question of what construct or characteristic the scale is, in fact, measuring. When assessing construct validity, the researcher attempts to answer theoretical questions about why the scale works and what deductions can be made concerning the underlying theory. Thus, construct validity requires a sound theory of the nature of the construct being measured and how it relates to other constructs. Construct validity is the most sophisticated and difficult type of validity to establish. As Figure 9.5 shows, construct validity includes convergent, discriminant, and entomological validity. Convergent validity is the extent to which the scale correlates positively with other measures of the same construct. It is not necessary that all these measures be obtained by using conventional scaling techniques. Discriminant validity is the extent to which a measure does not correlate with other constructs from which it is supposed to differ.Tt involves demonstrating a lack Qf correlation among differing constructs. Nomological validity is the extent to which the scale correlates in theoretically predicted ways with ‘measures of different but ‘related constructs. A theoretical model is formulated that leads to further deductions, tests, and inferences. Gradually, a nomological net is built in which several constructs are systematically interrelated. 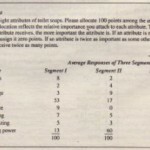 We Illustrate construct validity in the context of a multi-item scale designed to measure sclf-concept.i? Relationship’ Between Reliability and Validity..
be said about the generalizability of the scale to other universes. To generalize to other universes, generalizability theory procedures must be employed. In addition to theoretical considerations and evaluation of reliability and validity; certain practical factors should be considered in selecting scaling techniques for a particular marketing research problem.’! These. include the level of information (nominal, ordinal, interval, or ratio) desired, the capabilities of the respondents, the characteristics of the stimulus objects, method of administration, the context, and cost. . .
As a general rule, using the scaling technique that will yield the highest level of information feasible in a given situation will permit the use of the greatest variety of statistical analyses. Also, regardless of the type of scale used, whenever feasible, several scale items should measure the characteristic of interest. This provides more accurate measurement than a single-item scale. In many, situations, it is desirable to use more than one scaling technique or to obtain additional measures using mathematically derived scales. In designing the scale or response format, respondents’ educational or literacy levels should be taken into account.32 One approach is to develop scales that are or free of biases. Of the scaling techniques we have considered, the semantic differential scale may be said to be It has been tested in a number of countries and has consistently produced similar results. The researcher has the ethical responsibility to use scales that have reasonable reliability, validity, and generalization. The findings generated by scales that are unreliable. invalid, or not generalization to the target population are questionable at best and raise serious ethical issues. Moreover, the researcher should not bias the scales so as to slant the findings in any particular direction. 1;his is easy to do by biasing the wording of the statements (Liken-type scales), the scale descriptors, or other aspects of the scales. Consider the use of scale descriptors. The descriptors used to frame a scale can be chosen to bias results in a desired direction, for example, to generate a positive view of the client’s brand or a negative view of a competitor’s brand. 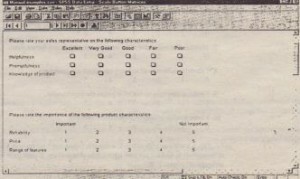 To project the client’s brand favorably, respondents are asked to indicate their opinion of the brand on several attributes using 7-point scales anchored by the descriptors “extremely poor” to “good.” In such a case, respondents are reluctant to rate the product extremely poorly. In fact, respondents who believe the product to be only mediocre will end up responding favorably. Try this yourself. How would you rate BMW automobiles on the following attributes? Many types of businesses are marketing to people over the phone, by e-mail, by text messages, and by direct mail without any consideration for the individuals they are trying to persuade to purchase their products. Many direct-marketing companies, including insurance, health care, and telecommunication companies, have paid billions of dollars in fines for unethical marketing practices. 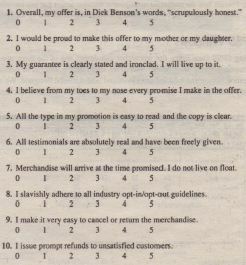 Denny Hatch has proposed the following honesty scale for companies using direct marketing. When you think of the word “monster,” what do you think? Scary creatures under your bed? Elmo and Grover from Sesame Street? The Walt Disney movie titled Monsters, Inc.? These days, the word “monster” also refers to the online job search company that has connected millions of job searchers with employers. This company was founded in 1994 by Jeff Taylor. and Sal Iannuzzi was appointed chairman and CEO in 2007. It is the leading online global careers network and the world’s number one hiring management resource. As of 2008, its clients included more than 90 of the Fortune 100 and approximately 490 of the Fortune 500 companies. The company had operations in 36 countries around the world. No wonder this company has added a whole new meaning to the word monster. Monster makes heavy use of marketing research techniques in a unique way. Unlike companies such as Nielsen that conduct marketing research for different companies, Monster researches companies that are in need of employees to fill their positions and provides the service of matching job searchers to these companies. Although Monster is doing well, more and more companies have followed in Monster’s footsteps and have entered the arena of providing job search services. These competing companies include Hot Jobs With all of these different services available, the market is beginning to become saturated with Internet recruiting Web sites. It is important for Monster, now more than ever, to differentiate itself from the competition. 1. The success of Monster lies in matching the companies’ job specifications with the skills and qualifications of job applicants. What scaling techniques should Monster use to measure companies’ job specifications and job applicants’ skills and qualifications? 1. What should Sal do to gain market share over competitors?